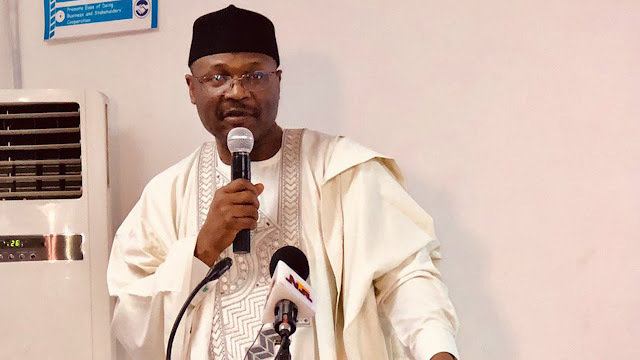 The Peoples Democratic Party (PDP) has alleged that President Muhammadu Buhari and the All Progressives Congress (APC) are planning to remove Chairman of Independent National Electoral Commission (INEC), Professor Mahmoud Yakubu. Speaking at a media briefing in Abuja yesterday, House of Representatives Speaker, Yakubu Dogara, disclosed that the Presidency and the APC were unhappy that INEC disagreed with plans to stagger the Presidential elections. Dogara condemned President Buhari’s shoot on sight order at APC’s National caucus meeting yesterday. The opposition party described the President’s statement “as a call for extra-judicial killings, considering the fact that there are adequate provisions in the nation’s laws to address electoral offenses. “These statements clearly indicate that our democracy has become the victim of a full blown dictatorship, when one considers that a democratically elected President could give a directive in clear violation of the laws of the land, which he swore to defend and protect in his oath of office,” it noted. The party also stressed that it supports genuine and transparent investigation of why the Presidential and National Assembly elections were shifted. “We also hope that the President’s statement is not a threat aimed at intimidating the electoral commission,” it added. However, the Delta State chapter of PDP has written Yakubu accusing National Commissioner of INEC in-charge of Edo, Delta and Rivers states, Mohammed Lecky Mustapha and a former staff of the commission, Regina Omo-Agege, of plotting to rig the Delta Central Senatorial election in favour of Ovie Omo-Agege. In the petition signed by Edmund Atas and Williams Asama on behalf of the party in Uvwie Local Government Area, they sought Yakubu’s urgent intervention to stop what they described as desperate undemocratic forces working to dim his (Yakubu’s) hard work of bequeathing a legacy of non-violent, credible, free and fair elections. “Permit us to draw your attention to the existence of corrupt officers and men of compromise in your commission colluding with political merchants to auction the rights of citizens to have their votes count through an iron cast electoral process that truly determines the final electoral outcome,” the petition reads.